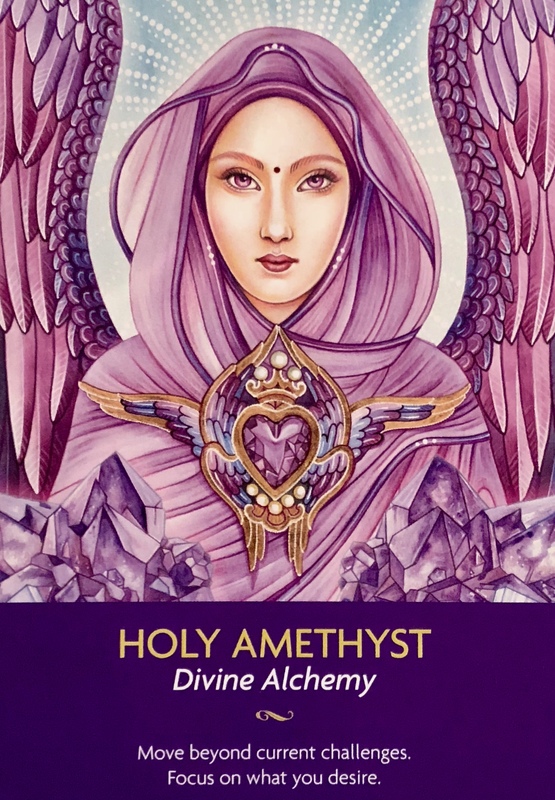 This is an invitation to connect with Holy Lady Amethyst as well as the crystal Amethyst. Wear, carry or place an Amethyst under your pillow to assist you in connecting with her powerful energies. Amethyst helps us to clear, purify, and release in our physical bodies and minds, while also strengthening our intuition and connection to the Higher Realms. It is a powerful dream time crystal, protecting us from nightmares and bad dreams, while assisting in dream recall. This is a time for transformation and transmutation of lower vibrational energies into something higher and lighter. It is a time of completing life lessons and tying up loose ends of karmic cycles. Lady Amethyst will assist us in this process. Releasing the old and embracing the new. Be particularly mindful of what you are creating at this time. Your thoughts, intentions, focus and energy is so much more powerful than you realize. You are creating in each moment. You are manifesting your reality in each choice, each thought, each feeling. Balance your energies. Surround yourself with positive and like minded people. Do what makes you feel passionate and free. Use your energy wisely, it is your most valuable commodity.